This book presents a comprehensive critical analysis of the most important Shakespearean critics, editors, actors and directors. This volume focuses on major 17th and 18th century critics and editors of Shakespeare. "Great Shakespeareans" offers a systematic account of those figures who have had the greatest influence on the interpretation, understanding and cultural reception of Shakespeare, both nationally and internationally. 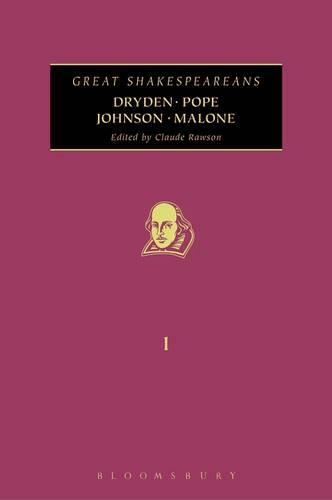 In this volume, leading scholars assess the contribution of Alexander Pope, John Dryden, Samuel Johnson and Edmond Malone to the afterlife and reception of Shakespeare and his plays. Each substantial contribution assesses the double impact of Shakespeare on the figure covered and of the figure on the understanding, interpretation and appreciation of Shakespeare, provide a sketch of their subject's intellectual and professional biography and an account of the wider cultural context, including comparison with other figures or works within the same field.